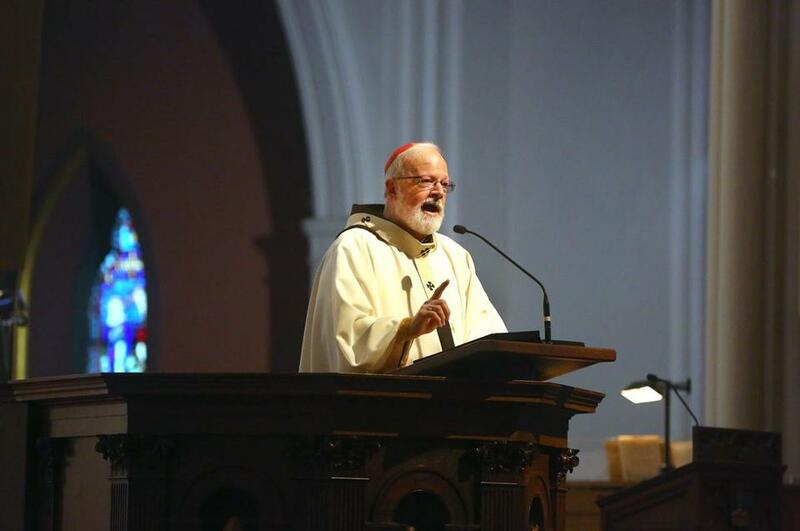 Cardinal Sean O&apos;Malley delivered his homily at a memorial Mass for former Mayor Thomas Menino, at the Cathedral of the Holy Cross. Cardinal Sean P. O’Malley remembered former mayor Thomas M. Menino on Sunday as a man of deep religious faith, who regularly attended Mass and prayed daily to St. Joseph, a humble carpenter. “St. Joseph is the patron saint of a happy death, having died in the arms of Jesus and Mary at his home in Nazareth,” O’Malley said during a Mass of Remembrance for Menino at the Cathedral of the Holy Cross. O’Malley drew a comparison to Menino’s death, at age 71, last Thursday. “Tom died having received the sacraments of the church and surrounded by his beloved [wife] Angela and their close-knit family,” he said. The Mass fell on All Souls Day, a holy day when Catholics remember those who have died. O’Malley asked the estimated 400 mourners from across Boston who filled the pews of Boston’s grandest Catholic church to pray for Menino, their loved ones, and the lonely. “On All Souls Day, we implore God’s loving mercy for all the faithful departed . . . both those whom we loved and also for those who have no one to pray for them,” O’Malley said. For some, remembering Menino on All Souls Day was fitting for a man deeply devoted to helping others. 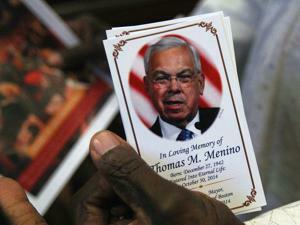 A prayer card for Thomas Menino. 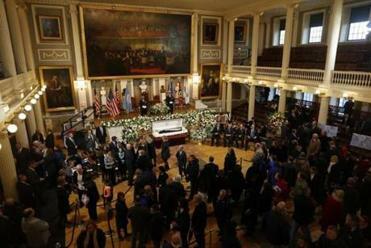 Mayor Martin J. Walsh and Police Commissioner William B. Evans attended the 11:30 a.m. service in the South End as Menino’s body lay in state across the city at historic Faneuil Hall. James Brett, chief executive of the New England Council and whom Menino defeated to win his first full term as mayor in 1993, also attended. “He was very close to the people, especially in times of trouble or tragedy, like the Marathon bombings,” the cardinal said as mourners listened in silence. O’Malley recalled his encounters with Menino at groundbreakings for affordable housing, at homeless shelters, and in neighborhoods hit by violence. In brief remarks to reporters after the Mass, O’Malley recalled a moving visit with Menino to a homeless shelter one Thanksgiving Day. Some mourners found solace in gathering to remember Menino in hymns and prayer. Armande Petit-Frere of Mattapan was one of the first to arrive at the cathedral. “He helped us to . . . buy our first home,” Petit-Frere, 58, said, describing a first-time home-buyer program run by Menino. “I admired him. I am here to pay my respects to a wonderful human being,” said Petit-Frere. Tashana Watson, a South End resident, said the Mass was a chance to thank God for Menino’s long service.